Two French girls get lost in the woods and accidentally enter the realm of sorceress Morgana Le Fay - who gives them the choice of either staying young forever as her lovers, or rot in a dungeon for eternity. 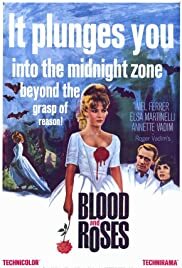 this is one of the best vampire movie I'd ever seen. This is beautiful and poetic. If you see this movie on English dialogue, you must see French version. English version has terrible narration. And this movie filmed in TECHNIRAMA, you must see this on letter box. If you don't, you have seen nothing yet.